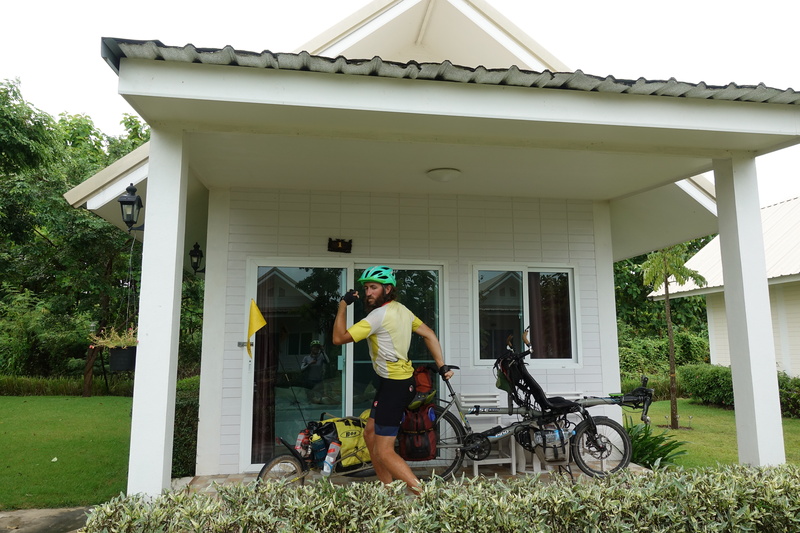 Overall about Thailand, we really enjoyed the facility of cycling across the country. The roads are excellent, the traffic fairly good (okay, except larger cities), and multiple alternatives to the highways. There are a lot of people in the country, but people usually pass cyclists with a lot of space, do not drive too fast. It is sometimes too slow! We had to overtake some motorbikes and cars driving at 15km/h just taking their time at multiple occasions. Clearly the most enjoyable thing that we had in Thailand is that we did not use the tent a single time and did not cook anything during the whole trip – even often the breakfasts! The hotels are good and reasonably priced, especially during the low season where the choices of accommodations large and excellent discounts offered. To make the choices faster, we had set our phone application ‘’Agoda’’ with a rating over 8.5/10 and price under 500 Bahts for two people (about 12EUR or $15), preferably breakfast included, and swimming pool very welcome! For food, we had literally no stock of food with us, not even snacks. Almost every village has several street food stalls (also every few kilometers, but often also anywhere in-between), any larger town will have a 7-Eleven (also every 10km), and all for a ridiculous charge (we became reluctant to pay $1.50 for a full meal in Chiang Mai after weeks paying less than $1). Our own bungalow – a luxury! We thus had days cruising 80km in 3h30 (usually 2h in the morning, 1h30 in the afternoon – normally a ‘short day’), not having to pack/unpack the bike, stopping every hour to get something to eat, getting super-fast internet through the cell-phone (if not a lightning-fast internet through Wi-Fi!) in the evening, and getting a top-comfortable room with AC at night. In short: cyclo-touring in luxury! However, Thailand felt all the way like ‘there is something weird’ in that country. Compared with Malaysia a little south, we had a lot less interactions with the inhabitants, without being unpleasant it felt a bit like ‘smiling because we are officially the land-of-smiles’ but not much more communication. The best administration in the country is clearly the army or the police, with the best equipment and facilities of every single village. We also realized that the country is politically one of the least stable around the world (17 coups in the last 100 years) and trending away from democracy. Malaysia had a lot of newspapers distributed and read everywhere, in all languages (even English) and we could see a lot of local meetings/debates together with political parties’ activities going on (we even talked to a MP while being invited at a Ramadan evening meal). Thailand on the other hand, has almost no written-press (or at least it is not available), the television is from what we could understand (and watch on the English-speaking channel NTV) ‘happy-news-in-happy-country-propaganda’ type, the best model friendly countries are Myanmar and Cambodia (the current massacres of the Rohingyas in Myanmar is apparently a micro event way exaggerated, but it is not much worse than protecting Pol-Pot for decades after the fall of the Khmers Rouges…), and the king is described as some kind of god-supreme-leader. If you get foreign cable channels, the channel automatically shuts down whenever Thailand is mentioned (positively or negatively) – it happened that all foreign channels were covering the cave rescue during our visit, and we realized that BBC/CNN/DeutscheWelle/France24 all had ‘a technical problem’ every time the rescue operation was mentioned. 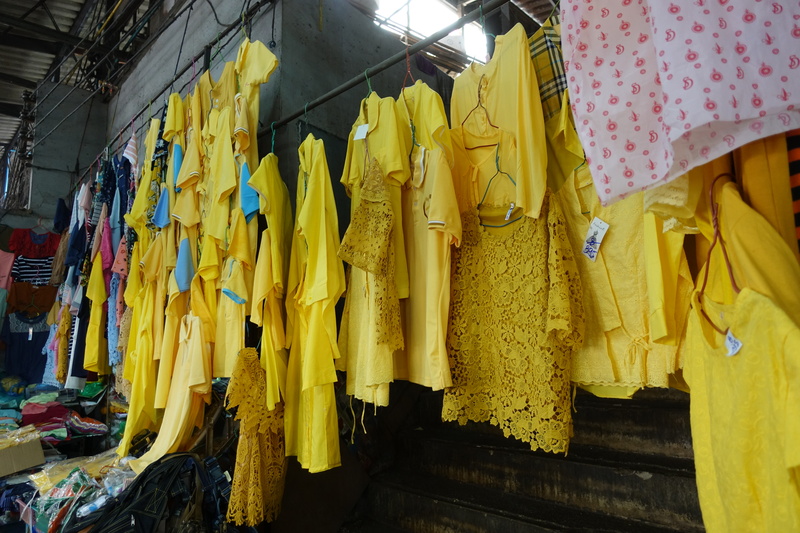 In July, the king’s birthday month, it was requested that people wear yellow to show their support of the monarchy… so a lot of yellow things were on display. We are posting this after having left the country (that could send you in jail, the internet is scrutinized thanks to Chinese technology! ), because any criticism of the monarchy is absolutely forbidden. The king is yet nothing of a model – no charisma, trying to transform the country into an absolute monarchy with the help of religion and the army, and in-between has for goal to become in the top-of-the-top-wealthiest list on earth. For the joke, he spends most of his time only an hour away from us in Germany in Starnberg (a nice town, we must admit, in case you are visiting Bavaria! ), but to a point where he was considered a full-time resident and asked to pay several billions of euros of inheritance tax when the dad passed away. Living just one hundred kilometers apart from one another in Bavaria! So, across the country, we felt that there were fewer schools than in Malaysia- particularly in the backcountry- but there is overwhelming presence of some propaganda to force everyone to revere the king. Each establishment was required to have a picture of the king hanging on the wall. Think of a mix of king Louis XIV in France for the costumes, Kim-Jung-Un in Korea for the kitsch paintings and slogans type ‘our king brought science to our country’ or ‘our king knows how to educate dogs’ (veridic), and some current oligarchies where the ruler is also the super-hero of the nation. I am not going to do any prognostics, but Thailand is not entirely cut off from the rest of the world, so I doubt that people will remain naïve and trusting for the whole reign of the current king. The propaganda really reminded me of Hosni Mubarak while visiting Egypt in 2002… and look what happened. From what we understood, the father and previous king (who died in 2016) was smart enough to still improve the economy a lot during his reign, remained politically in the shadow, and was thus overall appreciated. The son however, seems to be a little less wholesome (John Oliver called him a buffoon, that’s seem quite accurate), and is therefore a lot less in the Thai’s hearts. But again shhh, it’s not allowed to say it – as a foreigner you’ll get into trouble, as a political opponent you may end-up in the jail/crematorium which is literally located under his palace in Bangkok. With no good options, we decided to head somewhere with better weather! Note Cassie’s Thai alphabet skills! We had no intention to have to deal with the Chinese authorities. There is a taboo about what is going on in the west part of the country and the actions against ‘non-Hans’ have apparently increased since 2017. Getting a visa is now more difficult, it implies having to close our eyes in a train across half of the country and dealing with dictatorial police. Not interested! From a few feedbacks of other fellow-cyclists, going through China just does not seem particularly neither scenic nor enjoyable. From northern Thailand we could have gone towards Laos and Vietnam, but it is a very bad timing with the monsoon (it is raining heavily and non-stop, with landslides, a dam that collapsed in Laos, and you probably heard about the cave flooding story). Myanmar could have been another possibility, but we are also not interested in visiting a opium-producing (45% of the foreign trade, not even counting Meth and other funny products) rogue state (although its current prime minister and the Buddhism cliché make it look shinier than Afghanistan). We got a glimpse of Myanmar refugees in northern Thailand: Thailand organizes some human-zoos of long-neck-women who get no refugee status whatsoever and are forced to stay in villages transformed into amusement parks where visitors can take an almost original ‘National Geographic explorer’ type of picture. To visit the tribes, tourists unload from buses and are charged exorbitantly to see the woman. The tribes people (refugees) do not receive any of the, and if they complain, they get sent back on the other side of the border. We still try to have a bit of ethics, so no thanks! That’s also why we do not have any pictures of children dressed in traditional costumes (the parents are usually cashing-in next to them), or other sorts of human-trade. Maybe you will remember when your friends and colleagues will show you their pictures taken ‘remotely in the jungle’. Thailand was a nice country to visit, we enjoyed very much our almost 6 weeks and 2000km there, we felt that we have seen a good part of it, but we both also said that we would not particularly want to come back there on vacation in the next years. We just felt like posting a last post about some continuous weird feelings we had across Thailand. FYI, we are now very much enjoying riding through Kazakhstan and Kyrgyzstan (and hopefully the upcoming following countries). 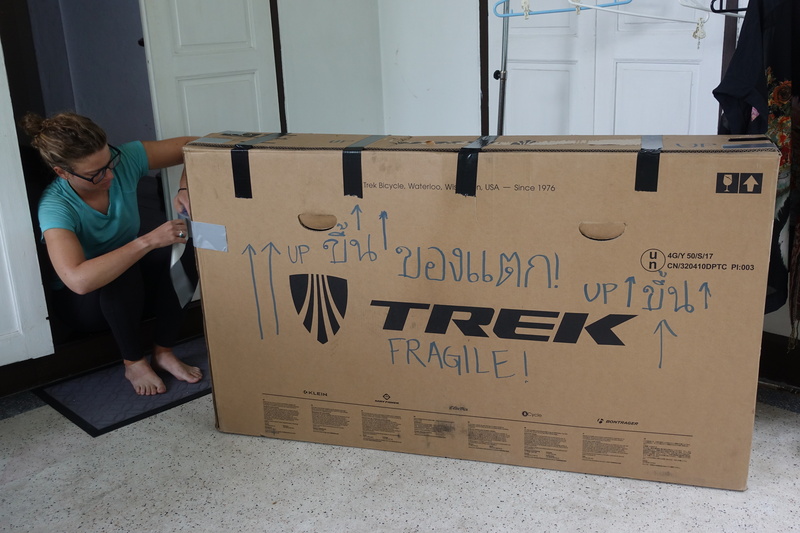 In the picture where you are packaging your bike… the written language is beautiful. The words look like art. Thanks for your insights of Thailand. I had an exchange student from there in a Foods class. Her photos and descriptions were so beautiful and intriguing and yours certainly echoed that. Best wishes on your next leg of the journey! Good to hear you are finally heading back to Europe. We’ve been reading on and off – it’s always insightful and entertaining to red! Now a more serious comment: I understand reservations towards non-democratic countries but there are a lot of bold or broad political analyses that could be discussed or need proof. Well, we ll keep reading and you stay safe for the next leg of your journey!!! Hi John, sure there are lots of not very democratic places, central Asia is not quite the model. 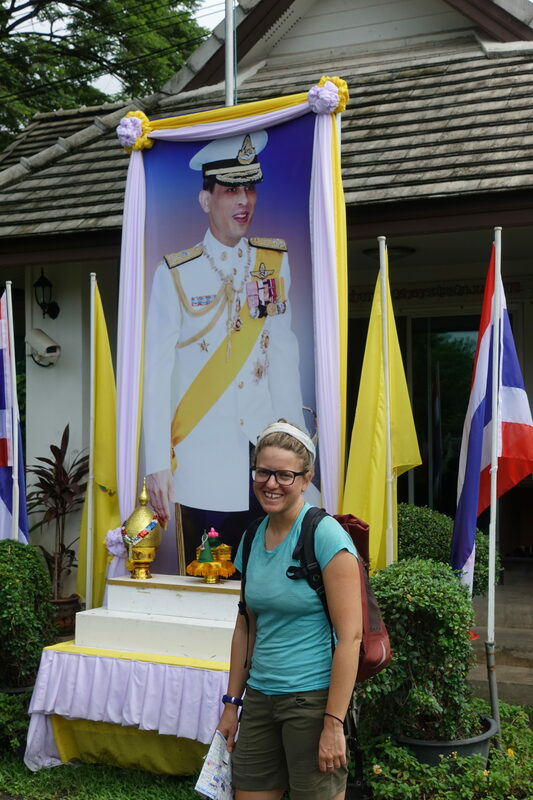 What we felt really weird in Thailand was mostly the trend chosen by the new ruler/king, and the way it’s done…not sure 21st century Thais want to have a semi-devine Sun-King! There’s been a lot of instability in the last past years, and it’s probably not over.